Learn more about the Pug. Learn more about the Boston Terrier. Print an adoption flyer for Bobbi and Sophie! About Me: We are a super sweet bonded pair. We used to be breeder dogs, but the breeder realized we weren't in a good place. They willingly surrendered us to this great rescue. Bobbi (the red girl) is deaf, so she relies on her sister to be her partner. Sophie (white) of course doesn't want to be anywhere without her sister. They are a wonderful pair. 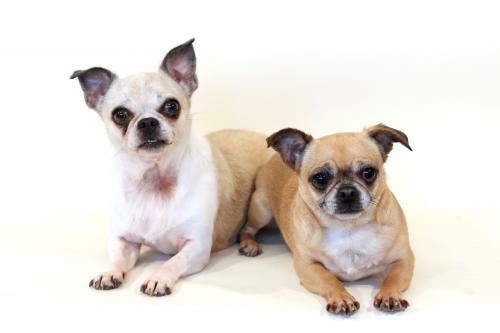 The adoption fee is for both dogs as a pair. Currently we do not know if Bobbi and Sophie will be able to attend the event, Adoption Event on Sunday, April 17th, 2016. Currently we do not know if Bobbi and Sophie will be able to attend the event, Adoption Event on Sunday, May 1st, 2016. See Bobbi and Sophie's attendance information for future events.